Forget 9 weeks time.....training starts tomorrow! I've been like a coiled spring waiting to burst into action for the last few weeks. The anticipation of the start of my training has been hard to take. I must be mad. Normal people would probably enjoy the calm before the inevitable storm. But not me. I'm desperate to put all of the words into action. I also think that getting such a huge pledge as I did yesterday has spurred me into action. I've already brought the start of my training forward once but I feel the time is right to do that again. So instead of a November 2008 start date I now have a September 2008 start date! Yes, that's tomorrow! It's going to be a nice steady start, covering the usual lunchtime routes as well as trying to get out for a run before and after work on some days. The target is a nice steady 50 miles for the next 3 weeks. This will reduce down to 30 miles in the 4th week before I add a little bit on for the next 4 week cycle. This slight increase in mileage will continue right up up until July 2009 when I should be able to run 110 miles per week, again decreasing down to 65 miles per week in the 4th week. Hopefully by then, with David and Mark's help I'll have the nutrition side of things sorted out. I've noticed that since I've started drinking beer again my diet has been effected immensely. I never was good at drinking 8 pints without a kebab! This is just one more reason to start training early. I've had 3 good sessions on the beer in the last 3 weeks. The effect it's had on my diet not to mention training has been very noticeable. So with that in mind I'll be knocking the beer on the head after September. I've got 2 night's out planned and after that I'll be totally on the wagon. It'll not be that much of a miss. It never is. I didn't have a beer between February and August this year. I survived! Anyway, watch this space for regular updates of my training. The next 3 years are going to be some of the toughest and most rewarding of my life. Oh and remember that the longest journeys start with just a few small steps. 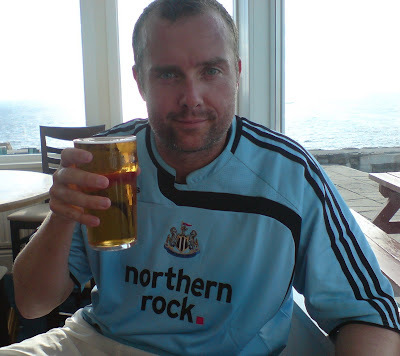 The first of which will be at about 12:15 tomorrow on a 5 mile run to Newcastle Race Course and back! Let the fun begin! And so it starts! The first pledge for the USA 2011 run has been made. And this isn't any old pledge. 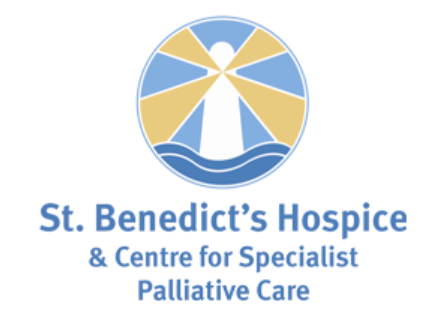 It's a £1000 pledge to be split between St Benedict's Hospice and The Children's Foundation on successful completion of the run. Immense thanks go to the kind sponsor, Ivor Potter for this amazing show of support. In fact, it is an amazing show of continued support as he was one of the contributors to last year's total of £34,108. Thanks Ivor!!!! And while I'm on the subject of totals, all of the Pennine Challenge fund has now been collected and stands at £1,300. An application for matching by the Northern Rock Foundation will be made by 2 of the team and hopefully the final total will be £2,600. There is no guarantee of this though but we keep our fingers crossed. One of the keys to success! In my mind, the chance of successfully running 3100 miles across the USA is about 5%. That may sound a bit negative but rest assured there are plenty of things that can and will be done (apart from the obvious running 12,000 miles in training!) to increase that number. For instance, I've always been a great believer in surrounding yourself with the right people. It makes perfect sense when you think about it. In fact, a certain Theodore Schumann once said "Surrounding yourself in your practice with the right people who have great attitudes is truly one of the keys to both success and happiness.". So with that in mind, I've been thinking about trying to get a proper coach and mentor to keep me on the straight and narrow and ultimately increase my chances of success. Mr Schumann explains further - "In order to grow in your field, you need a voice that understands where you're coming from and what your goals are. A mentor provides the wisdom you haven't yet achieved, or the motivation you need to take bold action. While you won't always agree with your mentor, you will learn to appreciate all he or she teaches you.". On Thursday this week I met with 2 potential suitors - David Fairlamb (pictured left) and a mutual friend Mark Fleming (pictured right supporting me on last year's big run). David runs a very successful personal fitness company (David Fairlamb Fitness) and Mark, who recently left Northern Rock, is studying to join his company. Just to give you an idea of the scale of David's outfit; he currently employs a number of accomplished male and female trainers, a highly qualified nutritionist, masseurs, a sports psychologist and a life coach. His business motto is quite in keeping with the spirit of my next big run; "No goal is too high if you climb it with care and confidence.". I think it is therefore reasonable to say that David is extremely well qualified and established and there is no doubt that he will prove a key partner to the USA 2011 team. Mark on the other hand, is just at the beginning of his fitness career. I think his real passion will eventually be to specialise in teaching fitness for golf. He has a lot of studying to do and qualifications to gain but no amount of text books and exams can provide what I think Mark can bring to the table. Without going into too much detail and bear in mind that this is from my viewpoint, Mark has given an unbelievable amount of care and support in a situation where all seemed lost. He has driven another person, in what has often seemed to be small painstaking steps, to reach their goals. If you read Mr Schumann's last quote above you would almost think he was talking with Mark in mind. Again, just like David, there is no doubt that Mark will be another key partner to the USA 2011 team. The three of us met last Thursday to set out an initial plan and the first step is an initial consultation with David. One of the things I was asked to provide in that meeting was a list of all of my calorific intake between Thursday and the consultation! It's a good job it didn't start from Wednesday as I had a massive Chinese banquet that night! The consultation will be detailed and intensive and will look at many aspects of my health and fitness. The outcome should make for interesting reading! After this, I will have regular coaching sessions with Mark which I've been told will not be easy. These will be a useful compliment to the current training schedule and should provide a regular benchmark as to my progress. 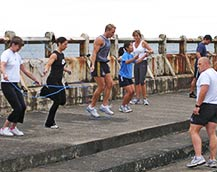 I also have the opportunity to attend David's "Beach Bootcamp" on a Saturday morning in Tynemouth (pictured). This is a 45 minute workout on the scenic Tynemouth Beach. The sessions are open to everyone and all fitness levels are catered for. Running alongside this session is BeachKid Bootcamp for 6 - 11 year olds. What a brilliant idea!!! I might even get Jack along to train. So, after having read this, I'm sure you'll agree that the chances of success are set to increase now that David and Mark are on board. Mark, I know fairly well. David, I only met for the first time last Thursday. It is easy to see why personal training is his field. He has an infectious motivational attitude about himself. I felt like I could be a world beater after the chat I had with him. That, together with Mark's drive and support means I may actually stand a chance of completing the required amount of training and ultimately the next big run across the USA in 2011. As an added bonus, I've certainly got a few more training options on top of running, cycling, spinning and gym work. I'm looking forward to getting on the beach on a Saturday morning! Fish and chips always taste nicer bought from the coast! 9 weeks until training starts! There are only 9 weeks left before I start training for the next big run. I have spent the last week putting together a high level training schedule. Training starts in November with a steady 50 miles a week and builds gradually to 110 miles a week by July 2009. Thankfully, every 4th week sees the mileage reduce temporarily. This will be the time when I hit the gym and work on building my legs up. Now here's a stat to make you weep! The total mileage to be done during training (Nov 2008 - May 2011) comes in at 11,800 miles!!! Add onto that the 3100 miles across the USA and over the next 36 months I will be running just under 15,000 miles. Sounds like a great plan when I write or talk about it. Believe you me I can't wait to get on with it! 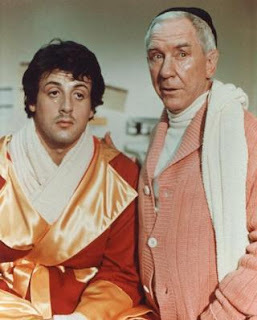 I've talked recently about trying to get a coach and mentor (like Mickey was to Rocky!) to assist me and keep me on the straight and narrow. I don't want to speak too soon but I've got a meeting tomorrow with a very experienced and well respected personal fitness trainer. If I can get him on board it will not only be a great coup but a superb addition to the USA 2011 team. Fingers crossed! Once again it is time to look back on what I was doing this time last year! 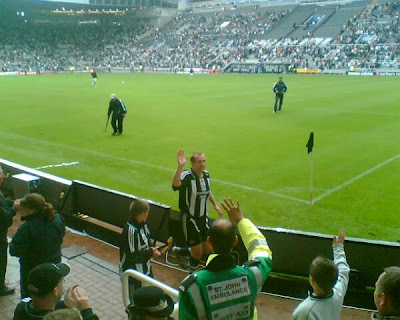 In fact, the Lap of Honour, I was awarded by Newcastle United, still feels like as much as a dream now as it did then! It was raining apparently as I ran round the pitch with arm aloft "Shearer style". I remember having the widest grin imaginable and was ever so pleased to sign 3 autographs along the way (2 of the autograph hunters were planted!). The Lap topped off the whole event quite nicely and stamped a big Geordie seal of approval on what was essentially one Geordie running 874 miles down the length of the country backed by 1000's of other Geordies. There are some super photos of the event taken by BBC Tyne which can be viewed here. My in depth analysis can be viewed here. Oh and while I think on, I was featured on a cracking local website today. Newcastlecentric.com ran a story on the up and coming USA 2011 run. It can be viewed here. I've also added a link on the right hand side of this page under media links. I've made a few appearances on various sites now. Long may it continue! 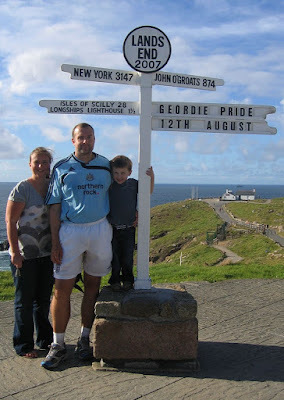 It is 12 months ago today since I reached Lands End with Katy and Jack in support (pictured). Little did we realise at the time that that photo was taken, but the final total for the run from John O'Groats to Lands End would be £34,108. I never dreamed that a sum of that magnitude could be raised, moreso given that the initial target was £5,000 for St Benedict's Hospice! Good times, as they say! The last 12 months have flown over and while it is nice to look back on last year's successful 874 mile run, my sights remain firmly fixed on running 3100 miles across the United States in 1000 days time. That's right! I've got just 1000 days to prepare for the next big run. I've got to say that even though the next big run is a long way off, I feel very well mentally prepared for it. I've got to keep this positive attitude over the next few years and add the physical side to go with it. It's going to be tough but if I surround myself with the right people and listen to what they have to say and they help me keep my feet on the ground I have every chance of success. I already have a few good running mentors. They know who they are. These guys have a quality record in the world of running and I'm sure that they will be as much an inspiration to me over the coming years as they were in the build up to last year's big run. That said, I'm looking for one individual to be my mentor and coach for the next big run in 2011. I'm looking for someone who knows what it takes to achieve impossible goals. Someone who can drive another person, against all the odds, to achieve those goals. That person has to have the ability to tell me that I can do something when I say I most certainly can't. I do have someone in mind for the job! I'll be buying him a few beers on Thursday and if time allows (and he's drunk enough) I'll be trying to persuade him to take on one of the most badly paid jobs going. Well I think it's been long overdue! Of course, I'm referring to a good old drinky poos! It's been February (before the Villa game actually) since I last had a drop of ale and I must say that I'm looking forward to my first pint in a long old while tomorrow afternoon. Mind you, I've got a small matter of a spinning class to attend to first of all, at lunchtime. I'm aiming for a personal best average heart rate of 160. I hear Andy is taking the class so I'm in with a good chance of putting in a good effort. If I manage to achieve that, then I'll have one heck of a thirst on for the beer session that is to follow! Tomorrow is just a warm up for a leaving do next Thursday where I'll be bidding farewell to a few colleagues in Town on what has been promised to be a full on night. I'm looking forward to both do's as it's often been said that I'm as good at drinking as I am at running. I think that was a compliment! Getting off to a flyer! After having spent the last couple of weeks studying the route across the USA I've now got a much better idea as to the size and scale of this task. As if I needed it! Make no mistake, the distance is massive! It's absolutely massive! I've felt for the last couple of weeks that the key to success will be to get in a long sustained period of high mileage in training. 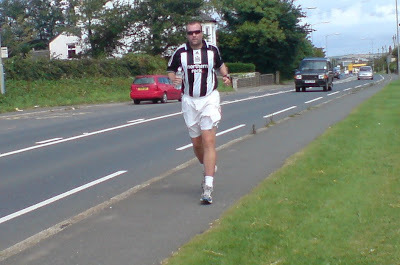 The aim has been to be able to run 110 miles a week from July 2009. I don't wish to change that too much. What I do wish to change, though, is the build up to that mileage and the recovery around it. The initial plan was to hit the ground running with 50 miles a week from January 2009 and add on a few miles per week until July 2009. I now intend to bring this forward a couple of months and start my training proper in November 2008. Once I get up to 110 a week in July, it'll be a case of 3 weeks of doing that followed by a "recovery" week of 70-80 miles. I'll be adding to that lot the usual mixture of Spinning classes, weights and cycling. I'll be pushing myself to the limit but it will be worth it by the time I set off from California in May 2011.